What is Universal Design for Learning and Universal Design of Assessment? Universal Design for Learning (UDL) is a set of principles for curriculum and assessment development that provides all students with equal opportunities to learn. 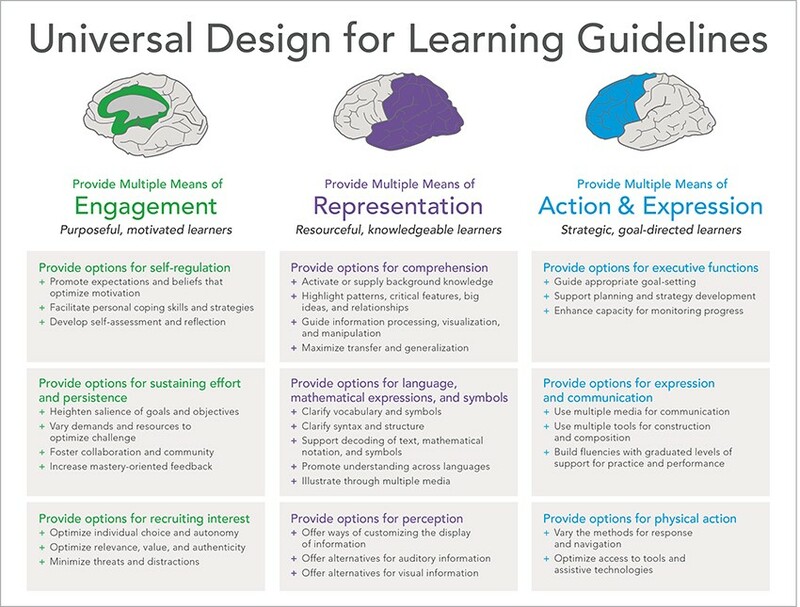 “UDL provides a blueprint for creating instructional goals, methods, materials, and assessments that work for everyone – not a single, one-size-fits-all solution but rather flexible approaches that can be customized and adjusted for individual needs” (National Center on Universal Design for Learning, 2012). UDL’s three principles are based on neuroscience research, which has identified three primary neurological networks that impact learning: 1) Engagement, 2) Representation, and 3) Action and Expression. These principles guide design of learning environments with a deep understanding and appreciation for individual variability by considering how students’ abilities can influence the representation of content, response to content, and engagement during learning. The UDL Guidelines (Meyer et al., 2014) provide checkpoints that guide educators in the development and implementation of UDL curricula and assessments. These Guidelines (see Exhibit 1) serve as a tool with which to critique and minimize barriers inherent in curricula and assessments as educators aim to increase opportunities to learn. Applying the principles found in the UDL Guidelines for assessments assists developers in addressing each of these seven elements. Why consider the principles of Universal Design to develop assessments? Accessibility is a key element in every phase of assessment system development and implementation. Central to the goals of an innovative assessment system is understanding how the provision of meaningful, research-based accessibility strategies and accommodations result in the accurate demonstration of broad representations of knowledge, and thus support valid inferences for all students. According to AERA/APA/NCME (2014, pp. 6-7), tests should be designed to facilitate and minimize construct-irrelevant barriers for all test takers in the target population. UDL seeks to make educational materials and assessments as accessible as possible to the widest variety of students while seeking to minimize separate-but-equal situations. How does one use the principles of Universal Design to develop assessments? Understanding the characteristics of the students taking the assessment is one of the first steps in the application of UDL principles to inform the design of each item and to minimize the need for adaptations and accommodations for students to access the measured construct. Through the application of a principled-design approach to assessment development, UDL principles should be carefully incorporated into the assessment item design including operational items, field test items, and test bank items. The UDL approach focuses the development of items for all students on construct-relevant content (the knowledge, skills, and abilities intended to be measured), minimizing the impact of construct-irrelevant skills (e.g., print size, lack of assistive technology device, inability to engage with the items) and considering appropriate accessibility options. By incorporating the guidelines of UDL as described via the National Center on Universal Design for Learning (http://www.udlcenter.org/), the SCILLSS partners will consider how students’ abilities and characteristics can influence the representation of content, response to content, and engagement during learning and address multiple means of representation (the “what” of learning), expression (the “how” of learning), and engagement (the “why” of learning) in the development of performance tasks/items (Rose & Meyer, 2006; CAST, 2011). UDL resources are available at the National Center on Universal Design for Learning’s Resource Library. American Educational Research Association, American Psychological Association, & National Council on Measurement in Education (AERA/APA/NCME). (2014). Standards for educational and psychological testing. Washington, DC. Higher Education Act of 1965, 20 U.S.C. §§ 1001–1161aa-1 (2008). National Center on Universal Design for Learning. (2012). What is UDL? Retrieved on October 18, 2017 from http://www.udlcenter.org/aboutudl/whatisudl. Rose, D. H., & Meyer, A. (2006). A practical reader in universal design for learning. Cambridge, MA: Harvard Education Press.